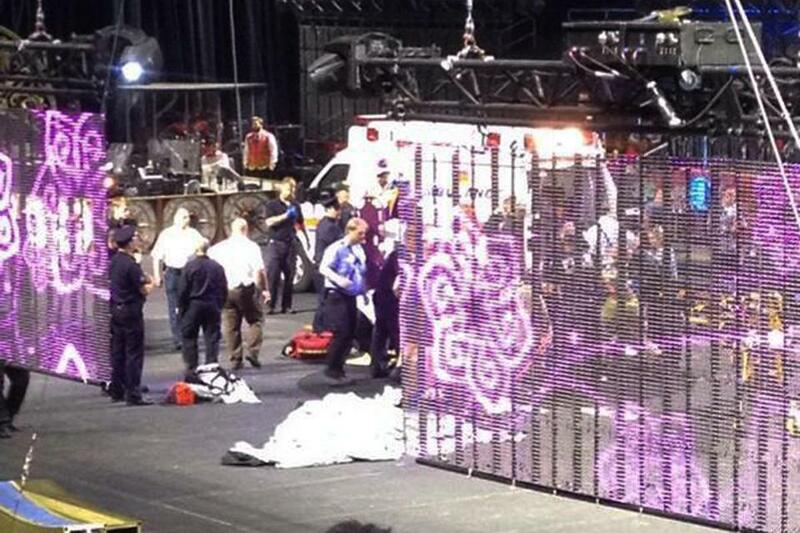 Emergency personnel attended to circus performers who were injured when a metal prop fell during a show. PROVIDENCE — A dramatic rigging collapse at the Ringling Bros. and Barnum & Bailey Circus Sunday sent eight aerialists plummeting to the ground as families watched in stunned confusion. All eight — who had been hanging by their hair from an umbrella-shaped rigging — were seriously injured, suffering broken bones, head injuries, and lacerations in the 30-foot fall, officials said. A performer standing below was also seriously hurt. “It’s traumatizing for the kids,” said Joseph Shoafi, who attended the circus with his wife and their three children, ages 3, 5, and 8. Federal workplace safety officials said they would investigate whether any workplace safety violations caused the accident. The inquiry could take several weeks, a spokesman said. Warning: For some viewers the images may be jarring. The act, called the “hair hang,” is performed by a troupe of women from places around the world including Brazil, Bulgaria, Ukraine, and the United States, according to the Ringling website, and was created by Andre and Viktoria Medeiros. In an interview April 24, Andre Medeiros told The Youngstown Vindicator, an Ohio newspaper, that he expanded the act from two to eight performers. The performance took place during the midday show of “Legends” at the Dunkin’ Donuts Center. The metal rig used in the ‘‘hair hang’’ act collapsed at about 12:15 p.m., said Stephen Payne, a spokesman for Feld Entertainment, the parent company of Ringling Bros. The injured women were taken to the trauma center at Rhode Island Hospital, said Fire Chief Clarence A. Cunha. He said police are also investigating the cause of the accident. “When that’s determined, we will open the show again,” Cunha said. 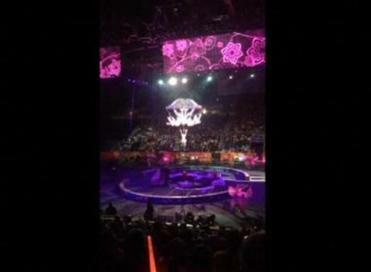 A YouTube video of the accident shows a shimmering curtain dropping to reveal a ring of acrobats suspended in the air, facing outward — forming what resembles a human chandelier. One woman hangs in the center, just below the rest. Circus-goers described a chaotic and frightening scene after the rigging fell. Ashli Croinex, 22, a Peabody, Mass., resident who was sitting about six or seven rows back, said that after the rig crashed to the ground, a performer who had been standing below was bloody and shaking. Croinex said the audience was initially stunned. Three ambulances drove into the circus ring, and the performers were carried out on stretchers, officials said. Roman Garcia, general manager of the show, said all of the injured acrobats were conscious. “We hope they will make a full recovery but, unfortunately, we don’t know if that’s going to happen,” said Steven M. Paré, Providence’s commissioner of public safety. Lawrence Lepore, general manager of the Dunkin’ Donuts Center, said he did not know how many people attended the Sunday morning performance. The center can seat 6,500 people, he said, but tickets were not sold out. Circus workers declined to speak about the accident. But circus performers and their friends peppered social media with testimonies and pleas for support late Sunday, with several people posting pictures of the Legends tour logo with the words “Prayers for” and “Circus Strong” pasted above the Ringling Bros. name. Audience member Allison Katz, a Walpole, Mass., resident who was at the show with her 5-year-old son and 2-year-old daughter, described the scene earlier Sunday. “They were about to start the stunt and the whole thing just dropped; the piece they were attached to dropped onto them, and it looked heavy,” she said. She said it took first responders time to lift the rigging off of the performers. Katz took her children and left. Shoafi said after the accident that an announcer called for an intermission. About 45 minutes later, a ringmaster took the stage and told the crowd that the rest of the show was canceled. The two other performances scheduled for Sunday were canceled. The circus had three additional shows scheduled for Monday, and according to the website for the Dunkin’ Donuts Center the 10:30 a.m. show has been canceled. Providence officials said that they would allow the other shows to go forward, but only if they do not include any aerial acts. OSHA officials could not provide information Sunday on how common workplace accidents are among circus performers. The federal Bureau of Labor Statistics showed 10 on-the-job deaths among all performing arts companies in 2011 and three fatalities in 2012, the most recent year for which data were available online. In February, stunt rider Julian Gomez of the Kazim Shrine Circus suffered a brain injury after crashing his motorcycle into a concrete wall in Roanoke, Va., according to published reports. French acrobat Sarah Guillot-Guyard died last June after falling nearly 100 feet during a Cirque du Soleil performance in Las Vegas. Michael Levenson of the Globe staff and correspondents Zachary T. Sampson and Todd Feathers contributed to this report. Material from the Associated Press was used. Gal Tziperman Lotan can be reached at gal.lotan@globe.com. Anne Steele can be reached at anne.steele@globe.com. Jeremy C. Fox can be reached at jeremy.fox@globe.com.